This animation was created with Maya 5 using nurbs surfaces for the characters. Motion was captured using the Vicon system, with myself playing both characters. The motions were recorded in one long take, so the trax editor in Maya was especially useful in getting the characters' actions to correspond. I've made guides available describing how to do full-body motion capture with the Vicon system and exporting motion data to Maya. Music is from Hopesfall's The Bending, which may be found on The Satellite Years from Trustkill Records. 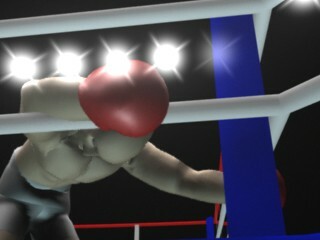 Kevin Forbes assisted with motion capture, and Patrick Coleman assisted with importing motion data into Maya.